In the Mojave and Sonoran deserts, different species of spring-flowering annuals germinate in response to different and rather specific combinations of moisture and temperature. Many of the showiest species require large amounts of rainfall when temperatures are cool but not cold. Because this particular combination of conditions is not common, showy spring-flowering annuals are not necessarily seen every year. In good wildflower years, showy species are abundant and diverse, carpeting the desert floor. Such years have a strong esthetic and emotional appeal for many people, but good wildflower years are also crucial to proper functioning of desert ecosystems. Some species of native bees rely exclusively on showy spring-flowering annuals, for example. The nutritional status of desert tortoises may depend on occasional abundance of showy, spring-flowering species. Certain ants and rodents prefer seeds of showy spring-flowering annuals over those of inconspicuous species when both are available. Moreover, granivores would quickly deplete seed reserves in the soil if not for occasional years of high seed production by spring-flowering annuals, many of them showy species. Thus, good wildflower years are not tangential to the ecology of desert communities but intersect it from many angles. When are good displays of spring-flowering annuals most likely to occur? Although popular and scientific literature frequently assumes a strong connection between El Niño-Southern Oscillation (ENSO) and good wildflower years, such assumptions are based on anecdotal, short-term evidence. My goals in this study were to identify good wildflower years in the Mojave and Sonoran deserts as objectively as possible, to assess the correlation between El Niño and good displays of spring-flowering annuals, and to examine the influence of rainfall amounts on good wildflower years. I compiled lists of common showy species for the Mojave (N = 31 species) and Sonoran (N = 28 species) deserts, then examined herbarium records to determine all years when each of these target species was collected during the 20th century. My reasoning was that first, showy species are represented by more individuals in more locations in good wildflower years than in other years, and, second, that plant collectors tend to be most active in seasons and years when many species are in flower. As a result, the chance that a particular species will be represented in herbarium collections should increase in good wildflower years. I plotted number of target species collected as a function of year, then used a detrending routine to remove linear trend from the data. I defined good wildflower years as those in which the detrended number of target species collected was greater than or equal to the average plus one standard deviation. Threshold values for good wildflower years were 9.2 target species for the Mojave Desert and 9.1 target species for the Sonoran Desert. In the Mojave and Sonoran deserts, good wildflower years occurred about once every 5 to 7 years in the 20th century. The connection between good wildflower years and traditionally defined El Niño episodes was weak, but when El Niño was redefined in a phenologically meaningful way as any calendar year in which the average Southern Oscillation Index (SOI) between July and December was negative, 21 of 27 good wildflower years in the combined deserts were associated with El Niño. Good wildflower years were 3.6 times more likely after redefined El Niño years than after other years. 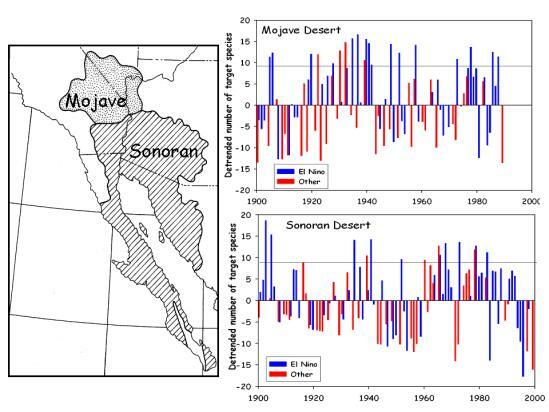 Rain in the months before good wildflower years was at least 30% greater than the long-term average in the Mojave Desert and at least 50% greater in the Sonoran Desert. Figure 1. Good and other wildflower years in the Mojave and Sonoran deserts during the 20th century. Good wildflower years were those in which detrended number of target species was > 9.2 (Mojave Desert) or > 9.1 (Sonoran Desert) (horizontal lines). Blue bars show number of species in springs following redefined El Niño years; red bars show number of species in springs following other years. Redefined El Niño years were calendar years in which average Southern Oscillation Index (SOI) from July to December was negative. A diverse flora of spring-flowering annuals occurred in the region during the late Wisconsin and early Holocene, which was a period of wetter, milder winters and cooler summers. Perhaps some species of spring-flowering annuals persist today in the arid southwestern United States only because frequent El Niño conditions recreate the cool, moist conditions of the late Pleistocene. Bowers, J. E., 2005. El Niño and displays of spring-flowering annuals in the Mojave and Sonoran deserts. Journal of the Torrey Botanical Society 132:38-49.